the Thames estuary in 1940. Overall print size 50cm x 43cm (20"x 17"). 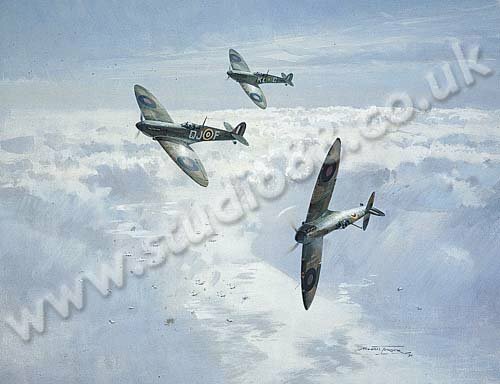 Each print is individually signed and numbered by the artist and countersigned by Battle of Britain pilots Wg.Cdr. PADDY BARTHROPP, Gp.Capt. C.B.F. KINGCOME and A.Cdr. J.W. LEATHART.